What compelled you to become an artist? Maybe it is in the genes! Recently at a family gathering I was told that one of my great grandfathers was a well-known artist on the island of Dominica, West Indies. My mum tells me that even as a very young boy of five, I always had a pencil and a bit of something to draw on. I express myself best through my art. Let me say … I use pens, charcoal sticks, highlighters, crayons, oil paints, pots of household paints, canvas, wax, an ironing board and a an old bath to dip my canvases into. Each stroke, each colour is fixed with wax and ironed flat. I love this technique because it gives my subjects luminosity and depth. There are certain elements of batik, but on the whole, my technique is unique to me. What is your favourite subject matter? I love dance, dancing and the way the human body responds to music. I also love drawing African animals, especially elephants. I love drawing these for kids, as well as for animal lover and travellers at heart. I see a lot of humour in these creatures. I love doing commissions. I get asked to paint pictures on demand – gifts for special occasions, a remainder of people’s travels. Also I can customise a favourite old wooden chest or box, a small coffee table or a toy elephant that has seen better days. 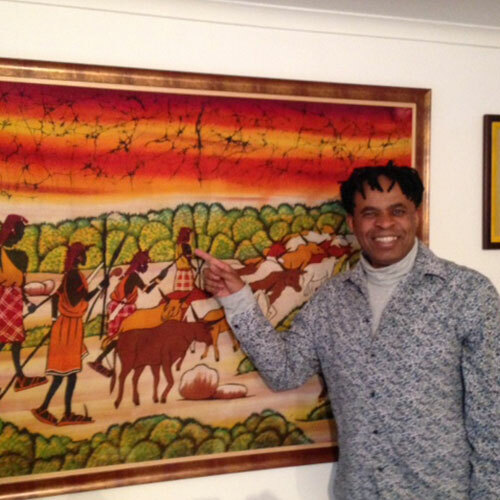 I can also paint wall murals – my African animals being a favourite. These would be suitable for kid’s bedrooms, on walls in nurseries or primary schools. I am interested in charity work – working with disadvantaged children teaching them how to express themselves through art. And finally, why Djibo Art? I first heard the name when I was a child. My mum told me that in her ‘old’ language it means ‘many lights’. I took the name because I like to play with light in my paintings. I know that Djibo is a town in northern Burkina Faso, West Africa, not far from the frontier with Mali. Recently I started doing a bit of reading on the region and its people, wondering if there is an ancestral connection between my art and my family’s roots in that part of the world. Would be fascinating to find out more!